If you're ready to try your hand at cooking homemade Thai food, these recipes will get you started. Explore Thai soups, appetizers, main course dishes and a dessert. Whatever type of Thai you're in the mood for, you'll find it here at its tantalizing best! 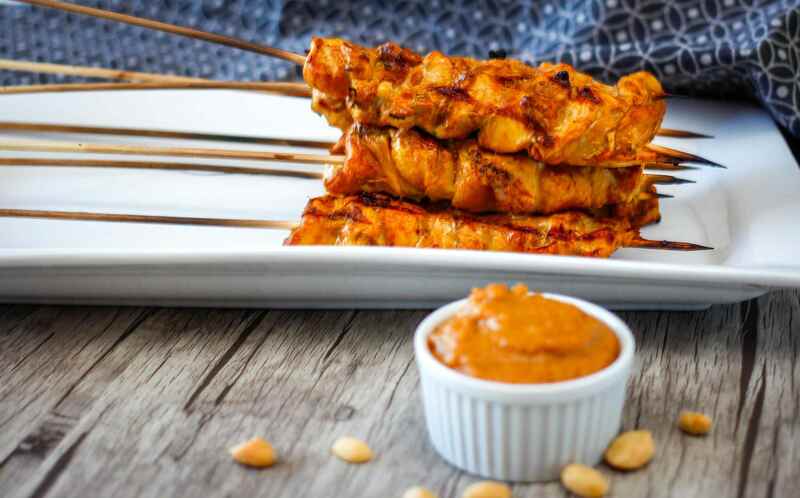 If you've never had the real stuff, then you'll fall in love with this special Thai chicken satay recipe. Strips of chicken or beef are marinated in a special Thai paste, then skewered and grilled or broiled. It is then served with homemade peanut sauce for a memorable taste. Each mini wrap provides a burst of Thai flavors that hit different parts of the palate all at once. It's based on the traditional Thai appetizer miang kum. It will be the hit of the party or you can make a platter to enjoy as a meal. This delicious soup might even be good for what ails you. It's a version of Tom Yum Goong, which is basically Tom Yum soup but with a little coconut milk added for thickness and flavor. Larb Gai is a classic, traditional Thai dish that is made with pork in Thailand, but this recipe uses chicken. Fresh mint is a key ingredient. Enjoy it hot over cold greens or on rice. It's called waterfall beef because of the splashing sound of juices on the hot grill. The beef is sliced thinly and served with a mixture of salad greens and fresh papaya along with a special Thai dressing. This is the most popular salad in Thailand, perhaps because it's low in calories but packed with flavor and crunch. Cooked shrimp, crab meat, or cashews can be added, or enjoy it with a bowl of sticky rice. The tiger is crying either from the chilies or because a hunter killed his cow. You'll marinate the beef and quickly broil it to medium-rare before slicing and serving it with a side sauce. Enjoy it with rice or in a salad. Chunks of tender chicken are simmered in a homemade green curry sauce along with your choice of vegetables in this gourmet-style recipe. This dish is very aromatic and beautiful to serve to guests. Panang curry features warm, rich flavors from Malaysia, Burma, and even India. It's a beautiful red curry usually made with chicken. While there are a lot of ingredients, you'll be processing them together and they will give it the complex flavor. This classic yellow curry hearkens back to the marketplaces and streets of Bangkok. It's made with chunks of chicken and potatoes with prepared curry powder, or you can make your own curry powder. This spicy noodle dish helps hungry late-night revelers in Bangkok find their way home. You can tone down the chilies if you prefer a milder version. It can be made vegetarian as in this recipe, or with shrimp or chicken, according to your taste. This traditional Thai fish recipe can be made outdoors on the barbecue, or you can pan-fry the fish indoors. Any whole white-fleshed fish can be used, and you'll love it teamed with the sauce. You can use nearly any type of fish fillets for this recipe, including salmon, snapper, cod, or tilapia. You'll slather them in a fragrant coconut sauce and bake them in banana leaves, tin foil, or parchment paper. Serve it with coconut rice, plain rice, potatoes. It's the most famous of all Thai desserts. You'll need sticky rice, also known as sweet rice. Place some fresh mango slices over the sticky rice and smother with the easy coconut sauce for a heavenly dessert.